Apple on Thursday released iOS 5.0.1, an update that the company says brings fixes for users suffering from decreased battery life under iOS 5. The update also sports a couple of additional features, including multitasking gestures for original iPad users, and bug fixes. 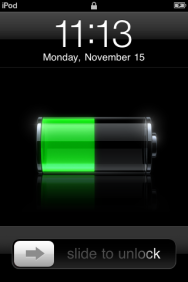 Many users have noted iOS 5 resulted in a decrease in battery life, with some iPhone 4S users noticing drastic loss of charge throughout a day. A number of features were suggested as possible culprits, including a bug in iOS’s automatic time-zone functionality, location services, and more. Last week, Apple responded to the complaints, stating that it had found “a few bugs that are affecting battery life” and promising a software update to address those issues. Reports also indicated that the company was reaching out to users who had complained about the issue, and having them help test the iOS 5.0.1 update ahead of its official release. In addition to the battery-related fixes, iOS 5.0.1 also brings multitasking gestures to users of the original iPad, hopefully soothing a sore point for users of Apple’s first-generation tablet, who were disappointed that the gestures were available only for the iPad 2 in iOS 5’s initial release. Apple also says that the update fixes problems with Documents in the Cloud—the file-syncing part of its iCloud service—and improves voice recognition for Australian users of the iPhone 4S’s dictation feature. 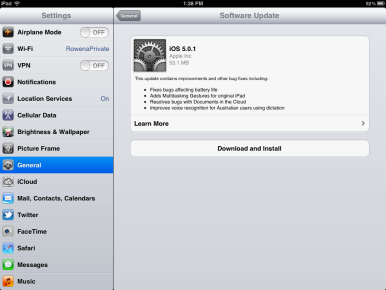 iOS 5, for the first time, allows you to update your device without connecting it to your Mac or PC. To do so, go to Settings -> General -> Software Update, and then tap the Download And Install button. As of this writing, not all devices are showing the update. Alternatively, you can still connect your device to your computer and perform the update via iTunes. Lex Friedman contributed to this story. Updated at 10:50 a.m. Pacific with information on the security content of iOS 5.0.1.